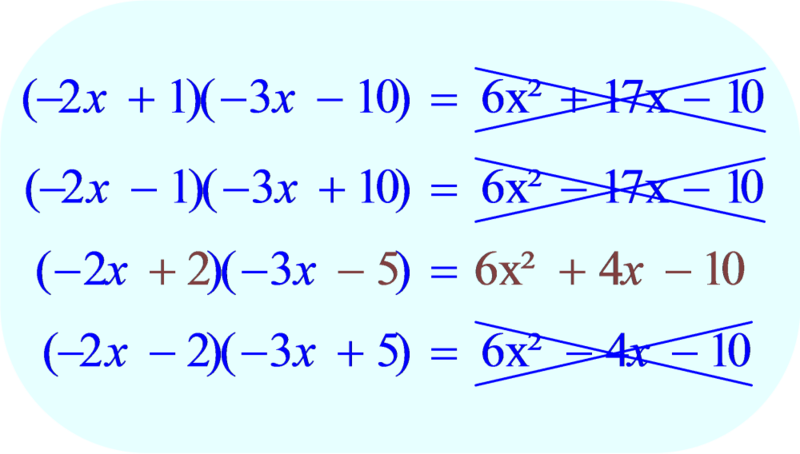 Explain how to factor the following trinomials forms: x² + bx + c and ax² + bx + c. Is there more than one way to factor this? Show your answer using both words and mathematical notation? 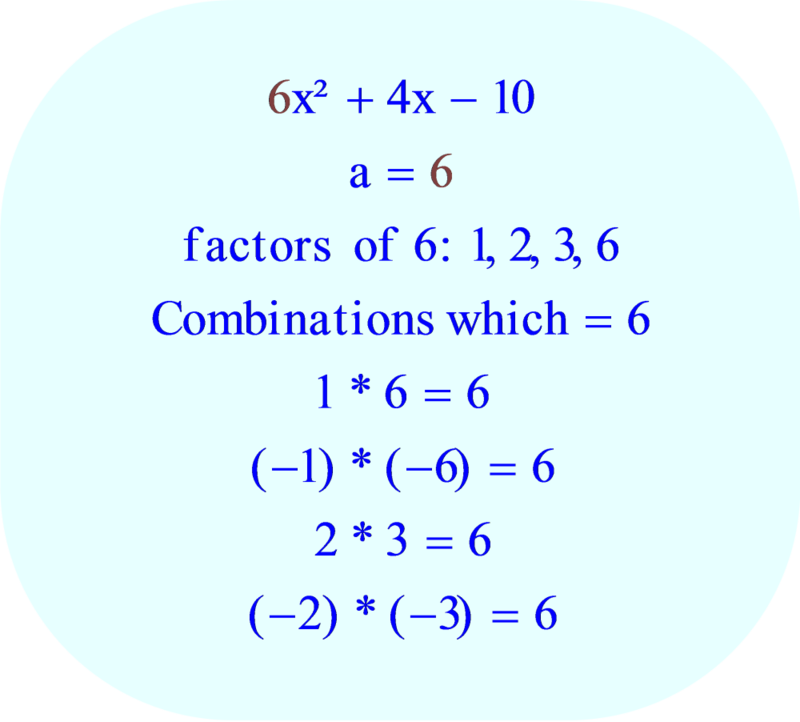 Provide an expression for your classmate to factor. A second degree trinomial can be factored as a product of binomials. There are many different ways to approach this problem. I am going to cover the "trial and error method" and the "quadratic formula". 4. 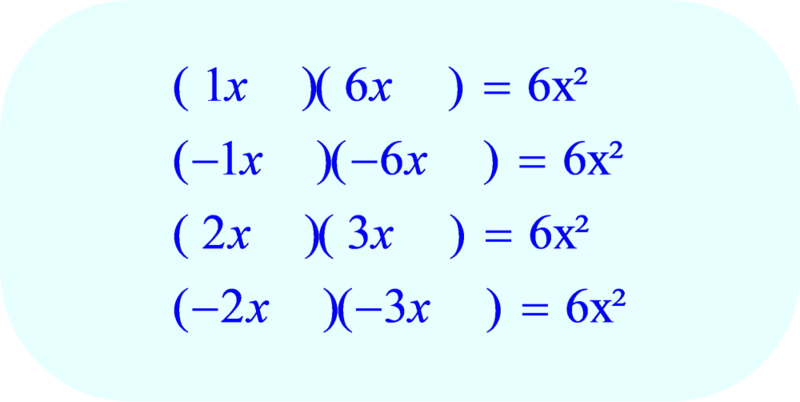 On left side of each set of parentheses, write the variable x. 5. Determine all possible coefficients for the variable x using the factors determined in step 1. There are four possibilities. 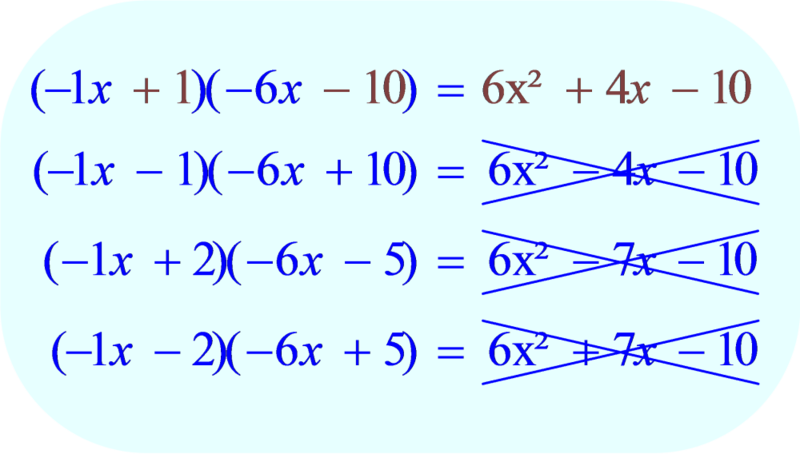 In each case, when the first terms of each parentheses are multiplied together, the result is 6x². 6x² is the first term of the trinomial we are trying to factor. 5. Determine all possible combinations for the second term within each parentheses using the factors determined in step 2. There are four possible combinations. 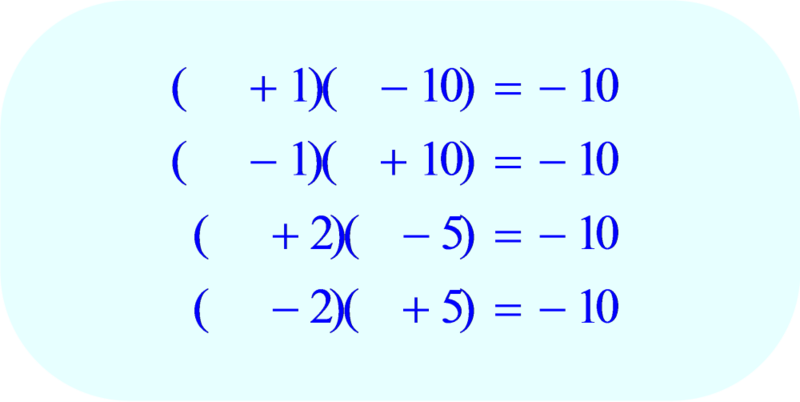 In each case, when the second terms within each parentheses are multiplied together, the result is -10. -10 is the constant term of the trinomial we are trying to factor. 6. (a) Synthesize the possible combinations for the second term with the possible combinations for the first term. Altogether there are 16 different possible groupings. 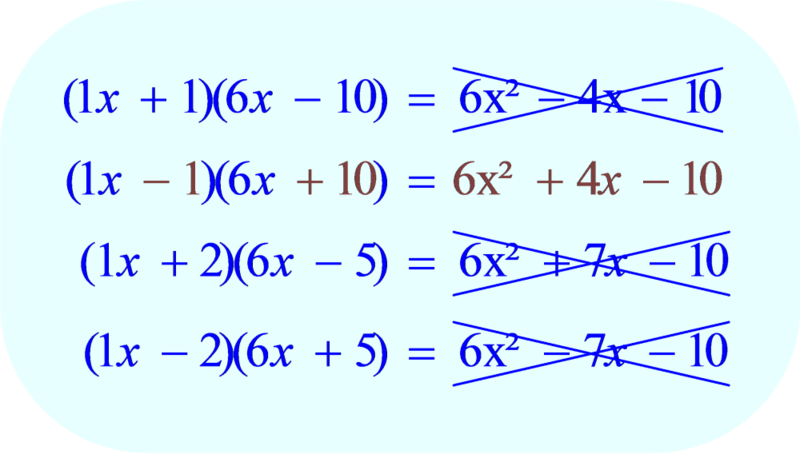 (b) Multiply the two binomials for every possibility to see which combinations are factors of the original trinomial. A second degree TRINOMIAL can also be factored using the quadratic formula. The advantage of using this method is that it always works. 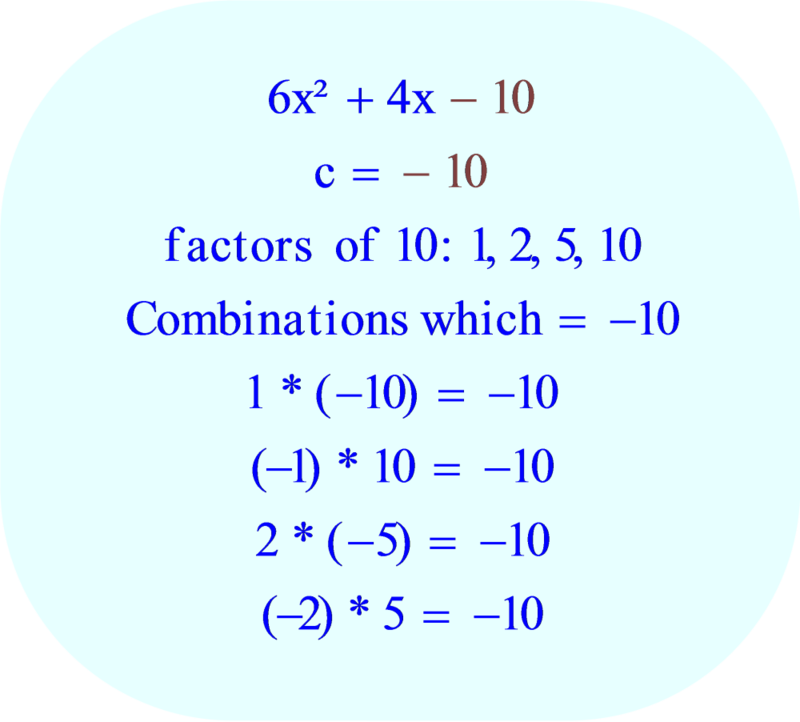 The disadvantage of using this method is that the factors will not always be composed of integers. To use the quadratic equation, rewrite the trinomial as a quadratic equation by setting it equal to zero. But, . 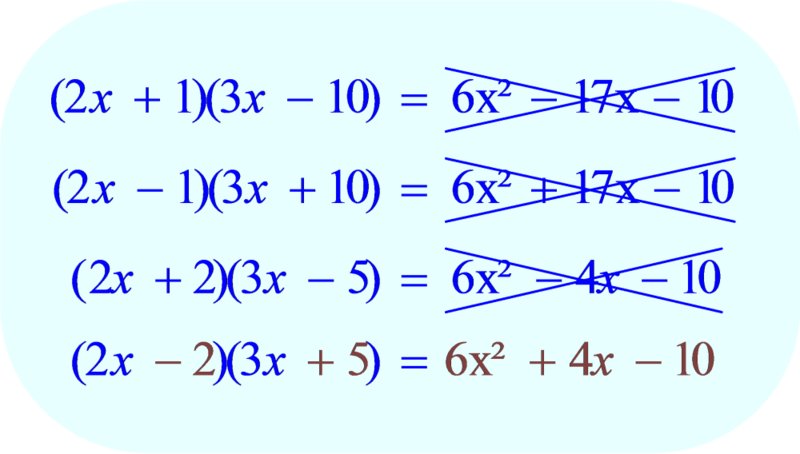 . . why doesn't multiplying the factors equal the original trinomial? 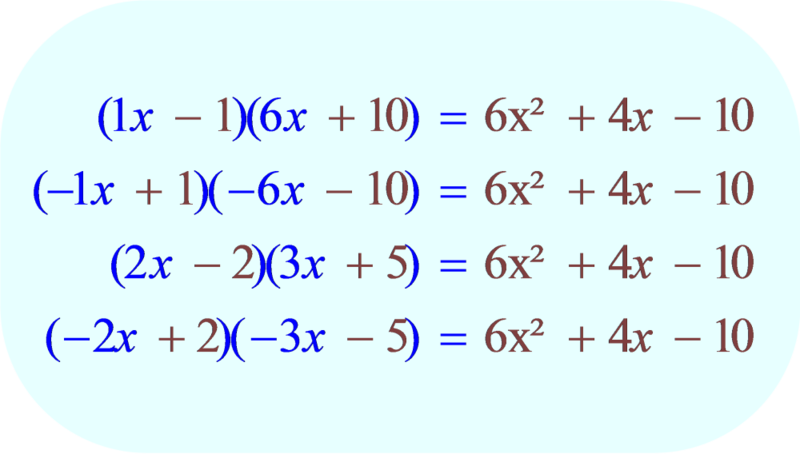 If you multiply each side of the equation by 6, the original trinomial in the example appears.